Which Kilt Shirt Should You Wear? Do you need a special kilt shirt to complete your kilt outfit, or will a normal shirt do? This question comes up fairly often, when people are considering buying their Highland Dress. Because the kilt is such a versatile garment, it can therefor be worn to almost every occasion imaginable. And depending on which occasion you are wearing your kilt, will determine which shirt is most suitable to wear. So how many different shirts can be worn with the kilt? Well lets start with the kilt in a formal setting, such as a Dinner, Burns Night, or as is becoming ever more popular these days, a wedding. Now for such occasions the kilt is usually worn with the Prince charlie jacket, and a dress shirt with a winged collar is normally chosen, worn with a black bow tie. 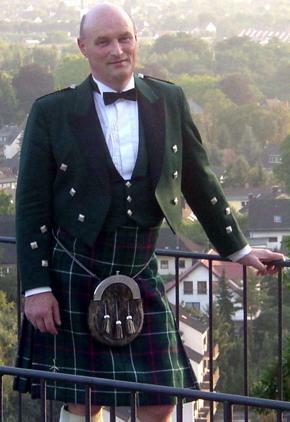 You can see a photo of me wearing my formal Highland Dress below. For less formal day wear, the kilt is often teamed with an Argyle jacket and waistcoat (vest). And on such an occasion a less formal dress shirt would accompany this outfit, often the colour of the shirt is chosen from one of the kilt colours. Another shirt that is very popular, and gives your kilt a more casual look is the Jacobite shirt, these shirts can be seen quite often at Highlnd games for example. They are also known as ghillie or Jacobean shirts, so don't be confused by the different names. Another shirt used in a casual setting is the Culloden shirt, but for all intents and purposes it is the same garment again as the Jacobite shirt, simply marketed under a different name. Many people also wear a simple t-shirt when wearing their kilts in a casual manner. So depending where and when you wear your kilt, you can always find the perfect shirt to accessorize it. If you need any further advice on this topic, or have any questions to do with this web site, please feel free to drop me a line using the Contact Us page, I am always delighted to hear from my visitors.